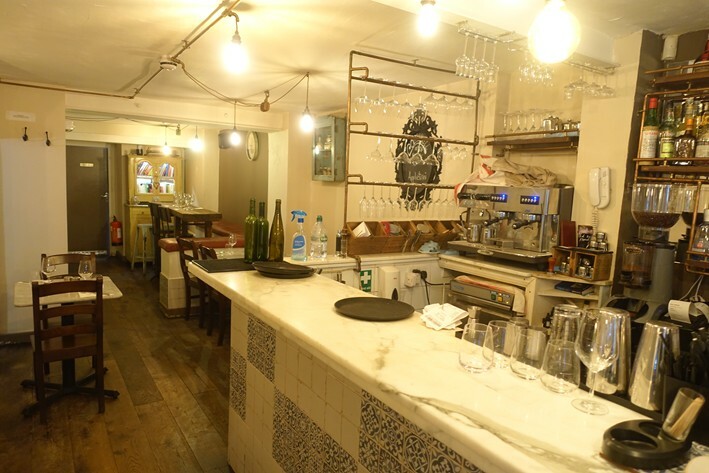 Eduardo Tuccillo was born in the Amalfi Coast, and worked his way around a number of restaurants internationally before opening Twist in 2014. 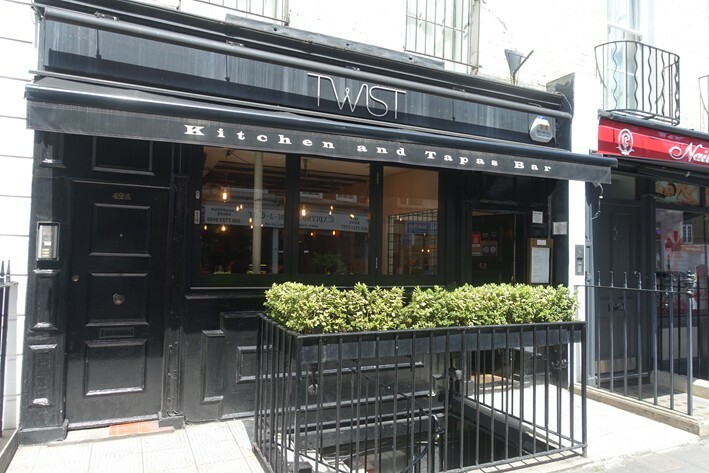 The idea of the restaurant sounded pretty suspicious to me– “a twist on tapas”. I was distinctly sceptical based on this marketing line alone, along with the idea of an Italian chef cooking tapas, until brought here by a very experienced diner. The main dining room is quite compact, with a further small bar are dining area downstairs. It is casual, with specials of the day on a blackboard as well as the main menu. It is not trying to do Spanish tapas, although there is Iberico ham on the menu. Instead there are a number of small plates (order maybe three apiece) that have some fairly eclectic influences. The chef claims to have particularly close contacts with his suppliers, and prides himself on his ingredient sourcing. The wine list had 43 full bottles ranging in price from £21 to £160, with a median price of £50 and an average markup of 2.5 times retail price, which is unusually kindly for London. Given this is a tapas restaurant, it was perhaps surprising to see just four Spanish wines on the list compared to 15 from Italy, but this presumably reflects the origins of the chef. Sample bottles were Good Hope Chenin Blanc 2016 at £25 for a bottle that you can pick up in the high street for £10, Greco di Tufo Vadiaperti 2015 at £47 compared to its retail price of £18, and Urbina Gran Reserva 1996 at £67 for a wine that will set you back £24 in a shop. At the top end of the list, Rene-Jean Dard and Francois Ribo Hermitage 2014 was £145 compared to its retail price of £74. Bread was supplied from The Bread Factory, and was quite good. Padron peppers are a tapas staple but these were unusual. For a start these, from northern Spain, were about twice the size of ones I was used to in London, and had excellent flavour, just seasoned with a little bit of fleur de sel. Both my companion and I struggled to think of when we had eaten better Padron peppers than these. It is really hard to score something like this, which is more shopping that cooking, but they were impressive. 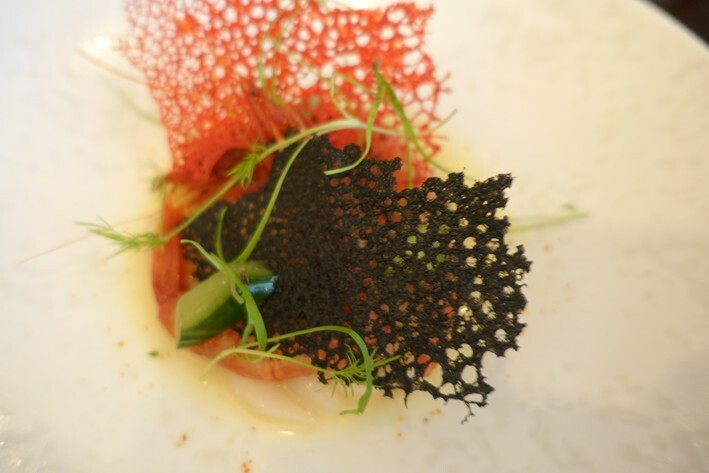 Japanese scallops with red prawns from Mazaro del Vallo were marinated with yuzu and served with pickled cucumbers and a juice flavoured with yuzu and liquorice. Given that they were from Japan and so clearly frozen, I was taken aback by the quality of the scallops. They had lovely natural sweetness, the yuzu bringing a touch of freshness. Similarly the red prawns were really high quality (15/20). 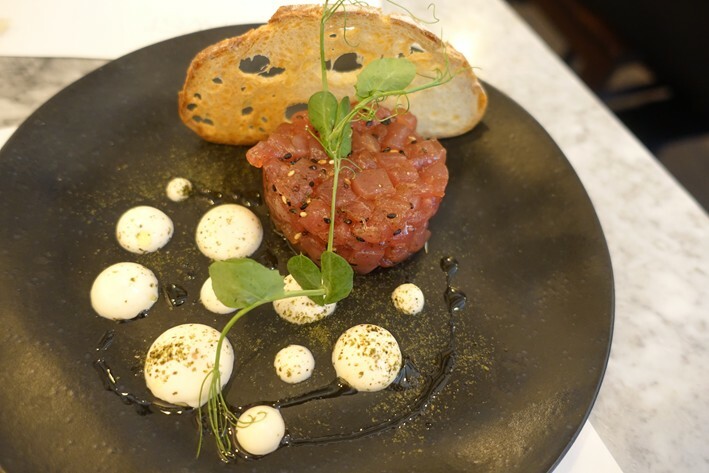 Tuna tartare was also impressive, with yellowfin tuna that was not chopped too finely, mixed with yoghurt, togarashi (Japanese chilli) and yuzu. The tuna was unusually good and the balance of the spice of the chilli and the acidity of the yuzu, balanced by the yoghurt, was spot on (15/20). 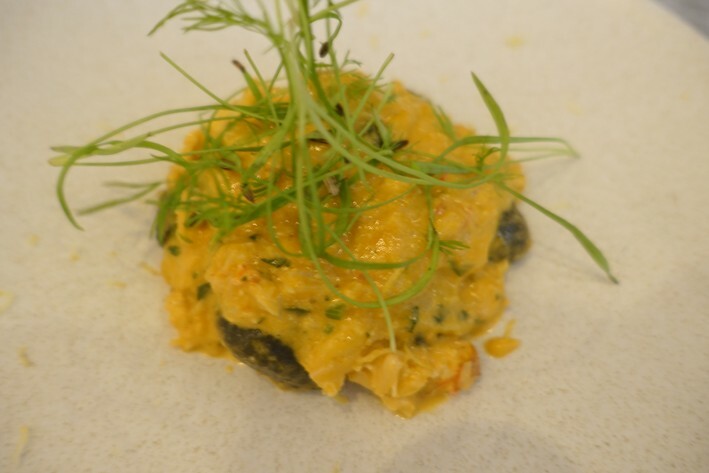 Gnocchi coloured with squid ink came with langoustine cream and Devon crab. This sounded lovely and the pasta itself was fine, but somehow the crab flavour seemed rather lost, the langoustine cream quite rich (just about 13/20). 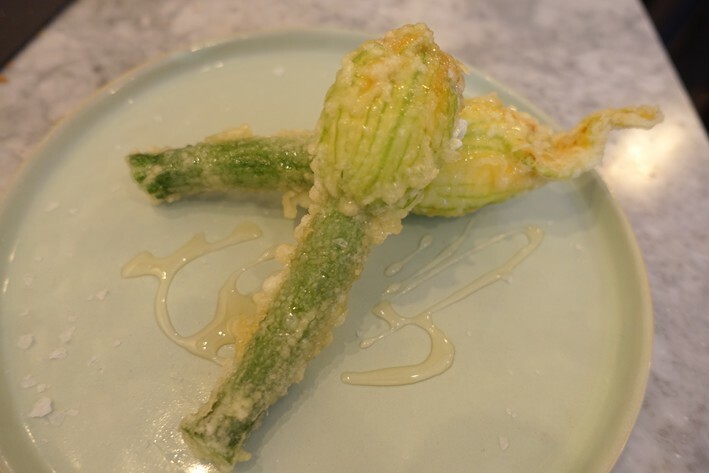 Fried courgette flowers were filled with ricotta cheese, mint, Amalfi lemon and honey. These were good, the mild cheese flavour and the slight sweetness of honey balanced by the acidity of the lemons (14/20). Tortelli was made from scratch in the kitchen and filled with Perigord truffle, panna acida (sour cream), hazelnuts, porcini dust and a reduction of Barolo wine. The pasta was again good, though for me there was just a touch too much sweetness overall (13/20). 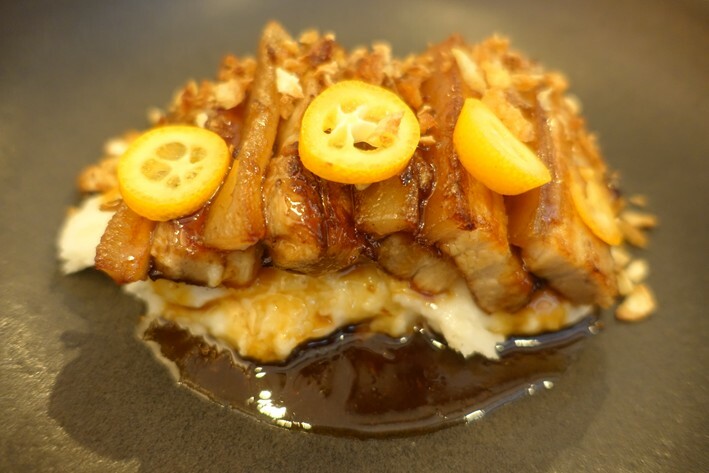 Pork belly strips were served with kumquats on a bed of mash notionally flavoured with Sichuan pepper. The pork had good flavour and was not to fatty, but the Sichuan pepper flavour was missing in action, although the kumquats provided useul sharpness and were not too sour (14/20). 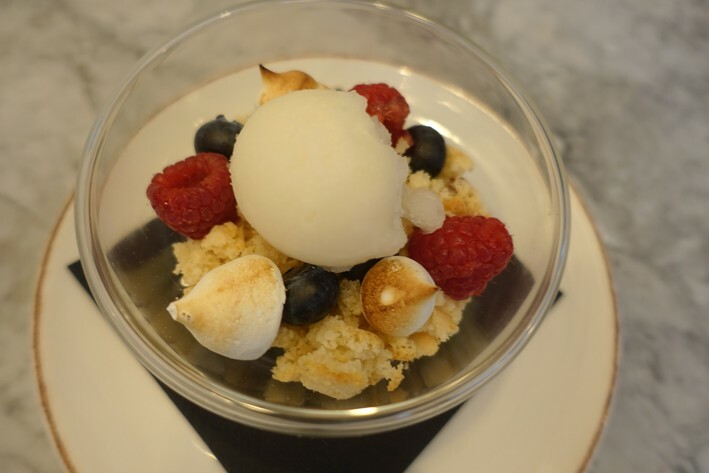 For dessert, white chocolate and almond crumble came with some mixed red berries, cardamom and Amalfi lemon sorbet. 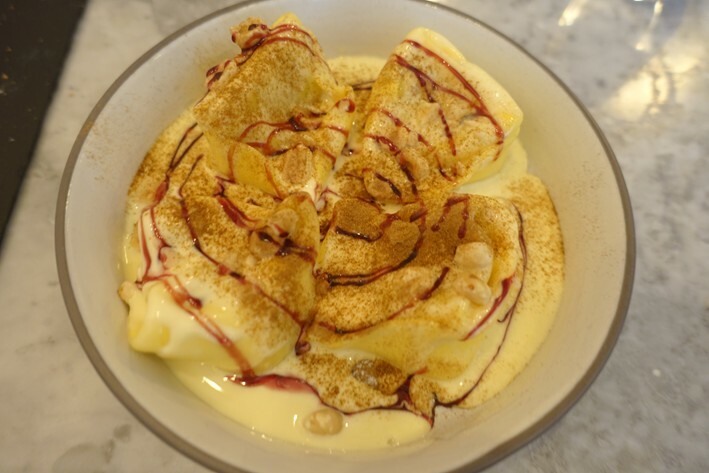 This was an effective dessert, the sorbet being the star – Amalfi lemons really do have superior flavour, and the texture of the sorbet was spot on (14/20). Coffee was from a brand called Galliano and was decent enough. Service was friendly and the bill, with a glass of wine to drink, came to £63 a head. This is not cheap, but we ordered a lot of food and the quality of ingredients was impressive. If you shared a modest bottle of wine but ordered a more sensible amount of food then a typical cost per head might be around £60. Overall, Twist is well worth a try. My main caveat is that I most enjoyed the dishes where the kitchen had intervened the least: the tuna tartare, the marinated scallops and prawns, and the Padron peppers, but even with this caveat the meal was still very good. Don’t be put off by the wacky sounding “concept” but instead enjoy the high-grade ingredients being used here.